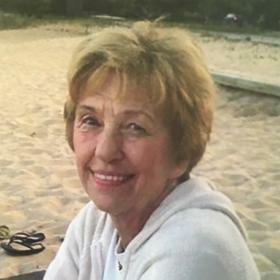 Patricia “Pat” Gogolin, age 84, of Holland, passed away Thursday June 21, 2018. She was born in Holland and is a graduate of Holland High School. Mrs. Gogolin met her loving husband John in Holland after his time in the service and they were married for 64 years. She was well known and will be remembered for her caring, loving, kind and compassionate nature. Pat participated in a swim group called the “Mermaids” at the Holland Aquatic Center for 18 years. She loved to travel and was always up for an adventure. Mrs. Gogolin was passionate and faithful in following the extracurricular activities of her children and grandchildren. Pat was preceded in death by her loving husband John in May, 2018; sister, Betty Baker; brother, Don Gilcrest. She is survived by her cherished children, Julie (Tim) Harrington, Katie (Ken) Roth, Gray (Jodi) Gogolin, Patty (David) Cyrus, Carrie Hungerink, Curt (Deanna) Gogolin, Jennifer Zrubek; grandchildren, Nicole, Zack, Emily, Tim, Robby, Ben, Abby, Jackson, Caden, Henri, Halle; 4 great-grandchildren; brother, Bill Gilcrest. Professional services entrusted to the Dykstra Funeral Home – Mulder Chapel.